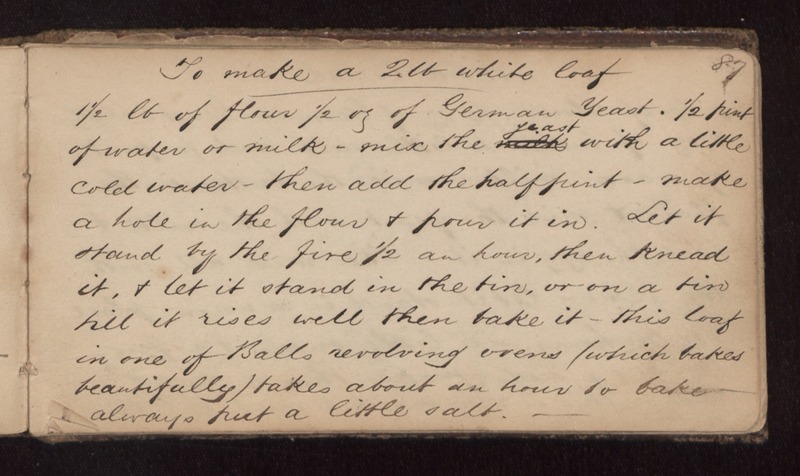 To make a 2 lb white loaf 1 1/2 lb of flour 1/2 oz of German Yeast. 1/2 pint of water or milk - mix the yeast with a little cold water - then add the half pint - make a hole in the flour & pour it in. Let it stand by the fire 1/2 an hour, then knead it, & let it stand in the tin, or on a tin till it rises well then bake it - this loaf in one of Balls revolving ovens/ which bakes beautifully/ takes about an hour to bake - always put a little salt.